What are Water Control Works? Changes or may change the location or direction to flow of water, including but not limited to water in a water body, by any means, including drainage. Large or small, a drain is a type of Water Control Works defined by The Water Rights Act. Drainage is the natural or constructed method of moving excessive surface and subsurface water from one area to another. The usual goal is to improve agricultural production, but this is also done for the purpose of development or keeping road and rail beds from having water sitting against them and reducing their integrity. The purpose of agricultural land drainage is to remove any water that is in excess of what the crops need during the growing season which, if not removed within a certain time period, could either destroy crops or substantially reduce yields. Agricultural drainage systems are not flood control systems; they do provide some degree of enhanced drainage of spring flood water and may accelerate the time by which seeding is possible, but their flood control benefits are incidental to their primary purpose of removing excess water from agricultural lands during the growing season. When drainage is undertaken without authorization, most times it will cause cumulative negative impacts to another person’s property either upstream or downstream. With authorization simply means that others’ interests are taken into consideration for the good of the landscape and the watershed. Water control works have many beneficial purposes. Dikes, dams and diversion channels can provide individual or community flood protection. Retention projects can provide a multitude of benefits such as flood reduction, water supply, water quality improvement, wildlife habitat, and recreation opportunities. Improving drainage of agricultural lands has economic benefits to landowners. Agricultural drainage allows more acres to be farmed, earlier seeding, increased yields, and less risk of losses due to access moisture and flooding. However, water control works and drainage projects can have negative impacts on water quality, quantity, and wildlife habitat on a local or cumulative, watershed scale. Steps need to be taken to be responsible and to reduce downstream impacts. Oversight of Drainage and Water Control Works through a licensing process helps to achieve sustainable water management goals. Licensing of drainage and water control works occurs through The Water Right Act and its associated regulations. To apply for a License to Construct Water Control Works, a license application form must be completely filled out and submitted with the license fee to the Drainage and Water Control Works Licensing Section. The addresses for mailing the application, documents, and fee are on the back of the form. An Application to Construct Water Control Works can be found here . At this time, payment for applications can only be made by cheque (preferably not mail cash) made payable to the Minister of Finance. Only one legal location per application form is allowed. Different sections must be on separate application forms. Adjoining river lots may be included on one form. The fee is for each application form. If applying for water control works on three different sections, then three application forms are required and with three application fees for a total fee of $75.00 payable to the Minister of Finance. For all new or altered water control works that will outlet onto someone else’s land, written consent must first be obtained prior to the works being undertaken and provided with the application form. Water that will be retained or stored can affect upstream neighbouring landowners – written consent must also be obtained for these water control works. A person leasing land can apply for a Licence to Construct Water Control Works. A consent form must be signed by the registered owner of the land indicating they agree and consent to the drainage works to be licensed and undertaken on their behalf. This process does not apply to leased Crown Land. For all new or altered water control works that outlet within one mile into a municipal drain, and flows stay within the municipal drainage system, written consent from the affected municipality is required. If the municipal drainage system outlets into, or becomes a natural waterway within 2 miles of the proposed drain outlet, additional landowner consent may be required. For systems that outlet into natural waterways, written landowner consent is required for any impacted landowners within 2 miles downstream of the proposed water control works outlet. For any systems that outlet into the Provincial Drain or Highway network, written consent from the affected government agency is required. The above list of requirements is specific to the surface water drainage aspect of a development only. Due to the nature of surface water drainage, there are other agencies that may have input regarding drainage standards and requirements that result from the nature of their infrastructure and/or individual mandates. Must include a photo, sketch, plan or drawing that depicts an accurate representation of the proposed works. Be sure to include the drain flow direction, description of works (including depth and distance) north arrow and location of the works and / or and industry accepted engineering plan and construction standards. Where water enters the Municipal Right-of-Way ("ROW"), written approval from that municipality is required in the form of a Council Resolution or a Consent Form signed by Councillor/CAO or approved designate. For more information contact your local Water Resource Officer or email drainage@gov.mb.ca. Should you be negatively impacted by licensed or unlicensed water control works, you may submit a complaint. Manitoba Water Resource Officers are responsible for issuing licenses and subsequent compliance of all water control works involving surface water pursuant to The Water Rights Act. Officers respond to complaints and reports of man-made water control works, inspecting or investigating alleged offences. Officers will determine if works are contrary to the law and assess what impacts have occurred to affect Natural Resources, Real estate, Infrastructure and other lands. If an offence has been committed, charges may be laid against the offending individual(s) and/or landowner(s). Depending on severity of the impacts and the history of the accused, he or she may be given opportunity to pay a set fine OR be given a mandatory appearance date to attend Provincial Court where a Judge will determine the penalty for the offence(s). Anyone convicted of an offence is responsible to ensure remedial work is conducted to bring the work into compliance with The Water Rights Act. Failing to do so may result in more charges and remedial work may be conducted by the province through an “Order”. The offender will be billed for the mandatory work and possibly face additional charges. Penalties for a corporation are by way of fines ranging from $0 to $25,000.00. Penalties for an individual are by way of fines ranging from $0 to $10,000.00. An individual may also be subject to imprisonment no longer than 3 months. Appeals regarding charges laid must be handled through the Provincial Court. Appeals regarding process of licensing and/or subsequent compliance by way of Orders may be heard through the Manitoba Municipal Appeal Board. 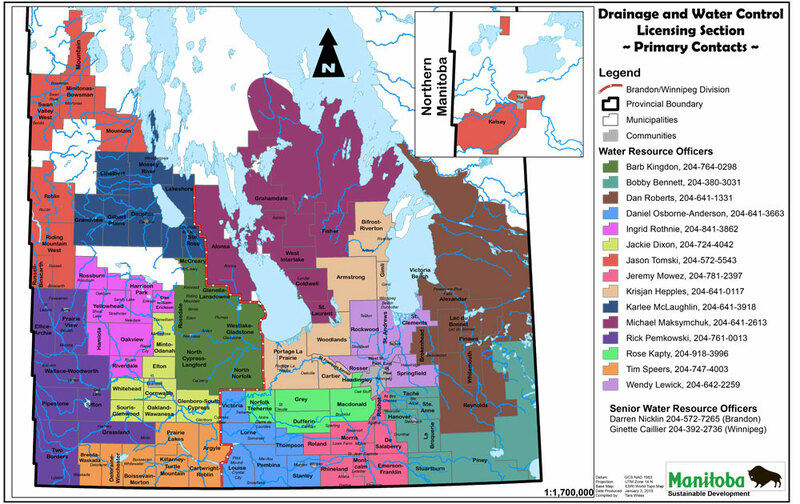 Q: Who owns the water in Manitoba? A: The Crown in Manitoba controls use and diversion of water throughout the province. Permission (or rights) to use water is obtained by license or authorization under The Water Rights Act (The WRA). The WRA gives all property owners equal access to drainage on a first come, first served basis. Q: When do I need a Water Rights License? Q: What are water control works? Q: Do Water Resource Officers have the right to access my land? A: The minister, or a person authorized by the minister, may enter any land to inspect any works or water control works constructed or established, or being constructed, established or maintained, by a licensee or permit holder. The minister, or a person authorized by the minister, may also enter land to investigate a suspected or alleged contravention of this act or the regulations. Q: What is the significance of the first-in-time, first-in-right principle? A: Licences that have already been applied for have precedence in relation to the date of submission of the application of each license. Note that a licensee is governed by the rights of all pre-established licensees. Q: What happens to a license when land is sold? A: When land is sold, the new landowner must contact this section at drainage@gov.mb.ca to have the existing Licence transferred to the new landowner. Q: What rights do I have as a licensee? Q: What are my obligations to maintain my water rights license in good standing? A: A licensee must construct the water control works as prescribed in the conditions of the approved license. Non-compliance with the conditions of the license may cause the license to be cancelled and may be subject to further enforcement which may result in monetary fines and additional required works. A licensee must notify the Drainage & Water Control Works Section about changes to existing licenses, mailing address changes or if the land to which the licence applies is sold or subdivided. Q: Am I held responsible for the Licenced works? A: A licensee is responsible for damage resulting from works constructed, operated or maintained, or from a defect, insufficiency or failure of the works, whether the license is in good standing, abandoned, suspended or cancelled. Q: How long is a Drainage & Water Control Works Licence issued for typically? A: Water Rights Licences are typically issued in perpetuity (lifetime). A license may be suspended or cancelled for not following the terms and conditions of the license. Q: How long does it take to get a license? A: Due to seasonal restrictions and current workloads, the average time to process an application varies by officer area. Q: I just bought land – how do I find out if there is an existing Licence on it? A: Contact us by emailing drainage@gov.mb.ca. The existing license will then be revised with the new landowner as the licensee. Q: Who is the local Water Resource Officer? Q: Do I need approval/permission from other landowners or the municipality before undertaking my project? A: Yes; affected downstream landowners approval of project is required before you apply for your project. Refer to application checklist for more information. Q: How do I find out if my application was licensed? A: Once the application has been processed, the applicant will be notified of Sustainable Developments decision in due course. Q: I mailed in an application but how do I know my application was received? A: When your application is processed you will receive a confirmation letter or email with your receipt of payment. Q: My neighbor is conducting water control works/drainage does he have a licence? A: Please contact us by emailing drainage@gov.mb.ca. Q: How much land can I apply for on one application? A: One section per application is accepted. However, if the water control works continue through more than one section, all land in which the works are located can be applied for on one application. Q: What is tile drainage? A: In agriculture, tile drainage is a type of drainage system that removes excess water from the soil below the surface by means of installing subsurface perforated tiles. Please see the Tile Drainage Fact Sheet for the requirements when submitting an application for tile drainage. Q: Can I still apply if I am the lessee or the renter? A: Yes, however you must have all contact information and written consent from the legal title holder included with the application when you submit it to Drainage & Water Control Works. Q: How much does an application cost? A: There is a non refundable $25.00 application fee that is to be paid by cash or cheque and submitted with the application. Q: Do I have to get downstream approval? Q: Is a drainage license the only approval I need? A: Depending on the proposed water control works, you may be required to get an Environmental Act License (http://www.gov.mb.ca/sd/eal/), approval from Department of Fisheries and Oceans (http://www.dfo-mpo.gc.ca/pnw-ppe/index-eng.html) or the local Planning District (http://www.gov.mb.ca/ia/land_use_dev/pdp.html). Q: Can I be charged or face a penalty for doing water control works without a license? A: Yes. Water Resource Officers can charge the individual, landowner or contractor responsible for the construction of water control works. Q: I received a letter that said my application was denied. Can I appeal this decision? Q: Can a municipality or Conservation District be forced to maintain a ditch by a Water Resource Officer? A: No, ultimately the RM or CD work within a budget and maintenance of ditches falls on the decisions of council or board. Q: Do I require a license to remove a beaver dam? A: No, a license is not required from the Water Control Works and Drainage Licensing Branch. There may be other approvals required from your local Conservation Officer.